CloudMagic, the personal search service that indexes your Gmail, documents, contacts, calendar and Twitter updates, is now available as a mobile app. The release follows a major update for the service this past fall, which added the ability to search Twitter and a move to host your personal index in the cloud. This switch is what enables CloudMagic to work across multiple devices, including now, iPhone and Android smartphones. Using the new mobile app, CloudMagic is surprisingly fast – and far more useful than the phones’ built-in search functions alone. We first looked at CloudMagic back in summer 2010 when the startup made its debut as a browser extension for Chrome and Firefox that indexed your Gmail and Google Apps. The extension is still around, if you want it, but is not required for the service to work. Instead, you can simply connect your accounts (Gmail, Google Docs, Google’s Contacts and Calendar, and Twitter) using OAuth. If you choose to use the extension, however, you’ll also have access to a CloudMagic search box you can access within Gmail or Twitter. 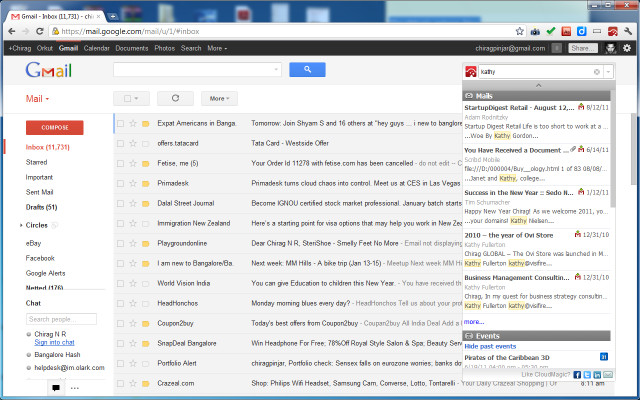 But even though Gmail’s native search is OK on the desktop, on phones, that’s another matter. Email search there is far more broken. Email search on the iPhone, for example, only lets you search by “From,” “To,” “Subject” and “All.” CloudMagic, on the other hand, allows you to search for names, a company name, a phrase you remember from a tweet or anything else. It also supports the use of the advanced search operators listed here. 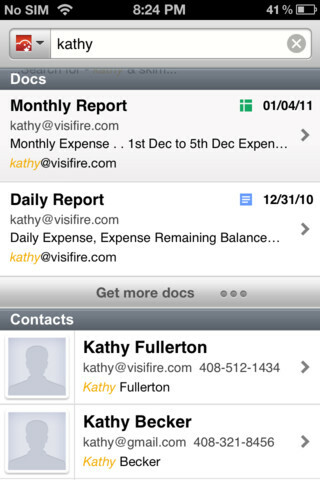 So now, for example, you can search for “filename:pdf” on your mobile to find all emails that have a PDF attached. Handy. CloudMagic, which competes with Greplin, still needs to integrate more services to be competitive. Greplin already includes Twitter, and it offers Facebook, Tumblr, Dropbox, LinkedIn, and Google Reader, too. But it’s still good to see some competition in the desperately under-served, on-device mobile search market. Yes, that’s a thing. A thing we need! You can grab the updated CloudMagic iPhone and Android apps from their respective app stores if you want to give it a go. The service comes from the same folks who brought you IssueBurner, the combo task management/helpdesk solution for small teams.